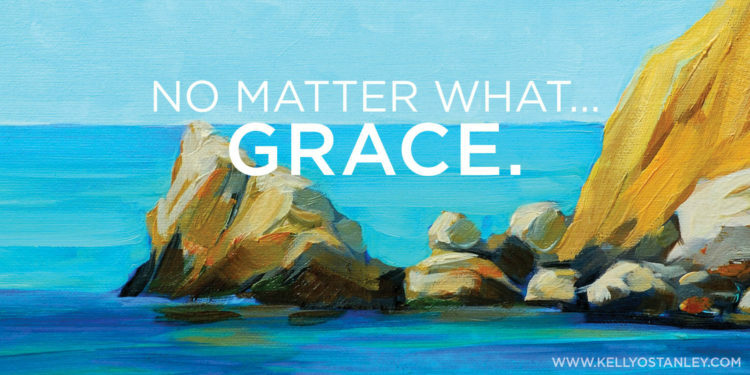 Do you really understand grace? I don’t. But oh, how much beauty there is in the sliver of comprehension that I can wrap my head around. I recently read The Ragamuffin Gospel by Brennan Manning, and it transformed my faith. Well, maybe that’s not exactly accurate. It validated the beliefs I’d already formed and pushed me even farther in that direction. I think grace is one of those words we throw around in the church and don’t really think about. It’s often defined as unmerited favor, but even that us misleading. It’s true that it’s not dependent on us; our merits don’t qualify us for it. But it’s also true that in the very act of offering so much to us, God makes us worthy. We’re not qualified, but God loves us enough to give us absolutely everything we need for all of eternity: His love. His forgiveness. His mercy. His compassion. His transforming power. Grace means that God loves us no matter what. He calls to us, woos us, pursues us, transforms us. It means that there is nothing else we could do that would make God love us more than He already does. It also means there is nothing we could ever do that will make Him love us less. There is no way to stop Him from loving us. There is no way to earn more—He’s already offered it all. Every last bit of it. It’s all held out to us, His Almighty arm fully extended. He doesn’t love me more after that really powerful quiet time I have than He did before I sat down to spend time with Him. That floors me. No matter what we do, His love remains the steady, life-giving force that defines us. When we make derogatory comments and participate in ugly political debates, He loves us. When we crumple on the couch, surrounded by tissues and consumed by tears, He loves us. When anger consumes and lust ignites. when our brains work for our benefit and when they turn against us. When white-hot jealousy and righteous indignation bloom, even then, God loves us thoroughly and completely. how wide and long and high and deep is the love God has for us. and purpose is thwarted and bank accounts dwindle and temptations seduce and wounds break wide open and despair devastates and malignancies lurk and darkness holds our secrets and when light reveals them. And you know what else? His love consumes and changes and colors our lives when things are okay, too. When we’re bored but steady, when we’re lonely but not alone, when we’re serving the least of these with fervor and compassion, when we’re leaning on Him for strength and sheltered in the wings of His love. When we’re standing at the mountaintops rejoicing, and when we’re kneeling at an altar, and when we’re studying the words He’s spoken and when we rest quietly in His presence. When we’re at the extremes, and when we linger in the middle. When we frequent places we don’t belong and behave in ways that aren’t like us at all. And when we behave in ways that are too much like us, and we wonder if we’ll ever be able to change. When we wonder how we could ever stand before God with our heads held high, and when we fall on our faces in fear and trembling and awe. When we believe we deserve what God offers, and when we understand the fundamental nature of our flaws and inadequacies and failings. When we write Him love letters, and when our words fail. When we feel Him, and when we do not. When we love Him back, and when we push Him away. Even then, especially then, God’s love prevails. That is the sheer beauty, the mind-blowing simplicity, the overwhelming gratitude and unbelievable truth of God’s freely-given grace.